Porto da Cruz is a civil parish in the municipality of Machico, on the Portuguese island of Madeira. This small village is the right place, if you want to freeze time and enjoy nature, the song of the birds and the impressive mountains, which enclose Porto da Cruz. It’s a place where you can find really good wine, ‘vinho seco americano’, a local dry red wine made of ‘americana’, which is a type of grape. There is an old sugar cane factory, since 1927 and it’s still working in the same way. If you follow the steam, you’ll find this 26 m/85 ft height tower. Penha d’ Aguia is an imperial rock that separates Porto da Cruz from Faial, a civil parish in the municipality of Santana, in Madeira. The view from up there, makes you feel like a bird. But, if you try to find more adventure, then take your body-board and feel the adrenaline while you are flirting with the reef-rocky waves. 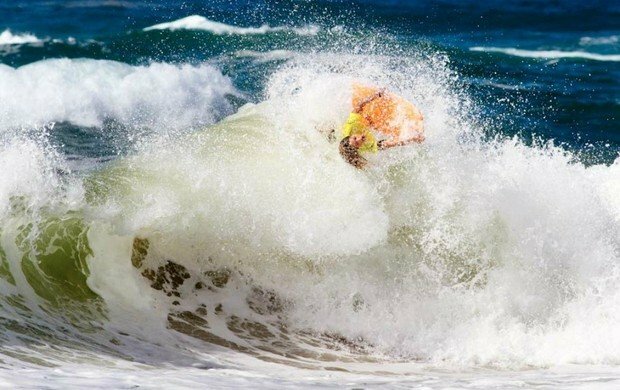 The conditions of Porto da Cruz beach, are appropriate for all kind of body-boarders. 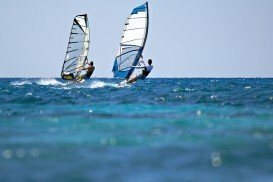 The north and south is the best wind direction, and for swell the north direction. 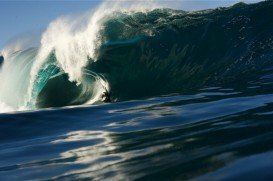 The swell size starts working at less than 1 m (3 ft) and holds up to 2.5 m+ (8 ft+). In detail, in autumn the wind blows onshore at 60% and the waves swell size is from 1.3 to 3 m (4-10 ft). In spring, we have the same swell size as in autumn and the wind blows onshore at 62%. In winter, the wind blows onshore at 47% and the waves are from 2 to 3 m (6.5-10 ft) most of the time. 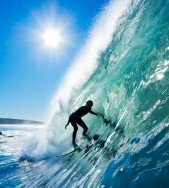 In summer the waves swell size is from 1.3 to 2 m (4-6.5 ft) and the wind blows onshore at 80%. There is a body-board school, in case you need an expert at your disposal. There are other activities in this nice village. If you visit this place in September, you’ll have fun in Festa do Vinho, a celebration with lot of good wine. There are also comfortable accommodations, in case you need a bed, after drinking lots of wine. We offer students comprehensive coaching, ranging from theory classes, warm-up and stretching exercises to close monitoring during the practical part of the lessons. Booking lessons: Because tides change daily, students should phone the evening before to book and confirm lesson times for the following day. Prices include sports insurance and equipment (wetsuit and board). Students should bring a towel and swimming costume. 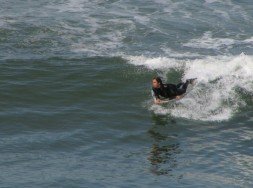 Instructors have post-graduate qualifications in surfing from the Faculdade de Motricidade Humana (Sports Sciences Faculty of Lisbon). Well-experienced and Portuguese Surfing Federation-accredited coaches. Facilities for student use (shower, changing area). 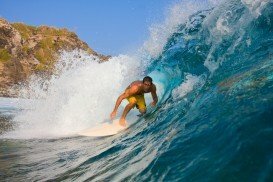 Boards for beginners and more advanced surfers (tailored to the level of each student). Wetsuits from well-known brands in a great range of sizes. We use mostly Wainman havaii kites and boards. Wind blowing from the north gives our location side on shore winds most times of the year, providing 20/35 kts of wind. The water temperature is around 14/18C in middle and high season. You will need a wetsuit or shorty on summer. The safety of a lake for child lessons or the extremes of the oceon for adrenaline junkies!!! For those days with light wind, 8/12kts, we ride kitebuggy or streetkite. – First attempts at jumping (depends on evolution:. – Certified instructors from IPDJ and IKO. – Full control of landing and relaunch of the kite. Our ‘surf boot camps’ were set up to provide students one or more weeks of intensive surfing. Students travel in the school van to Costa da Caparica (Praia do Infante), which offers perfect conditions for students to perfect their technique. This package is aimed at adolescents with some experience or beginners aged over 14. Boot camps run during the week (Monday to Friday), from 9 am to 6 pm, leaving from Amoreiras Shopping center or the surf school in Carcavelos. A song's lyrics stipulate that '''you leave your body behind you, when you leave this place''. If you try to practice body-board in Pedra Branca, you will sing ''I leave my soul behind me, when I leave this place''. Carmel River State Beach is a state park located in Carmel, north of Big Sur coast, in Monterey County, California, USA. Ponta do Sol is located in the south coast of the Portuguese island of Madeira. It's the warmest place of the island and the sun shines for most of the time. That's how the spot took its name after, Ponta do Sol or Point of the sun. Carpinteria State Beach is a protected beach in the state park of the city Carpinteria. It is located in the city of Carpinteria, at 12 mi/19.3 km south of Santa Barbara. Leave behind your cloudy mood, because in Ericeira there is only sunshine. It's a village on the western coast of Portugal, in the municipality of Mafra. It's a fishing place where harmony and peacefulness prevail. It's a center of gastronomy and trade. You can admire the historic monuments, the old public and religious buildings of great architecture. Carlsbad State Beach is a protected state park located in Carlsbad, in San Diego county, California, USA. Achadas da Cruz is a small village in the municipality of Porto Moniz, in Madeira, the Portuguese island. This place gives you the opportunity to run back to the old days, when everything was so pure and people were really close to nature. 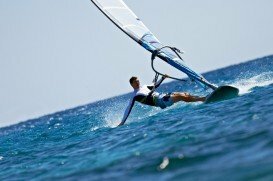 If you like the wind and you need a combination of surfing and sailing, then windsurf is the right choice. You can jump, spin maneuvers or invert loops, but you need the right spot. Let's travel in Paul do Mar, a small peaceful village. Ponta do Sol is a municipality in the southwestern coast of the Portuguese island, Madeira. Ponta do Sol or Point of the sun, as you can guess from its name, it's a place where you can enjoy the sun throughout the year than in any other place of the island. The long forests provide you with fresh air you need and the mystery of the treasures, that the trees can hide. Paul do Mar is a village, located in the municipality of Calheta, in Madeira, the Portuguese archipelago island. The location stands out as one of the most important fishing centers. A big variety of fish is available there, directly from the Atlantic ocean. In the Portuguese island, Madeira, you can find Sao Vicente along the north-west coast. Although it's located near the coast, it is well known as one of the more sheltered hinterland. Once you visit this place, you can admire the big houses, that run you back to the XVIII century. In the Portuguese island of Madeira, in the municipality of Porto Moniz, you will find Achadas da Cruz. It's a small village that you can't miss easily. The simple life of the villagers, the harmony and peacefulness make this place the right paradise, where you can escape from everything. Porto da Cruz is a small village, in the municipality of Machico, in the northeastern side of Madeira, a Portuguese island. It's enclosed by the mountains of Paul da Serra. Pico do Larano (765m/2509ft), Pico da Suna (1040m/3412ft) and Pico da Maiata (766m/2513ft) are the highest points. Its name derives from a cross (Cruz), that the explorers placed on a loch, that once used as a port (Porto).